Preheat oven to 350 F. and grease and line a 9x13 baking pan with parchment paper, ensuring that the paper along the long sides extends above the pan a bit, to act as handles to remove from the pan later. Set aside. In a large bowl, whisk together the flour, graham cracker crumbs, baking powder and salt. Set aside. In a large bowl with an electric mixer or in the bowl of a stand mixer with a paddle attachment, beat together the butter and brown sugar until light and fluffy, about 2 minutes. Scrape down sides of bowl. Add eggs and beat until well combined. Reduce mixer to low and slowly beat in the flour mixture until combined. Remove and set aside about 1/4 of the dough. Press the remaining dough into the prepared pan to form a thin, even layer on the bottom of the pan. 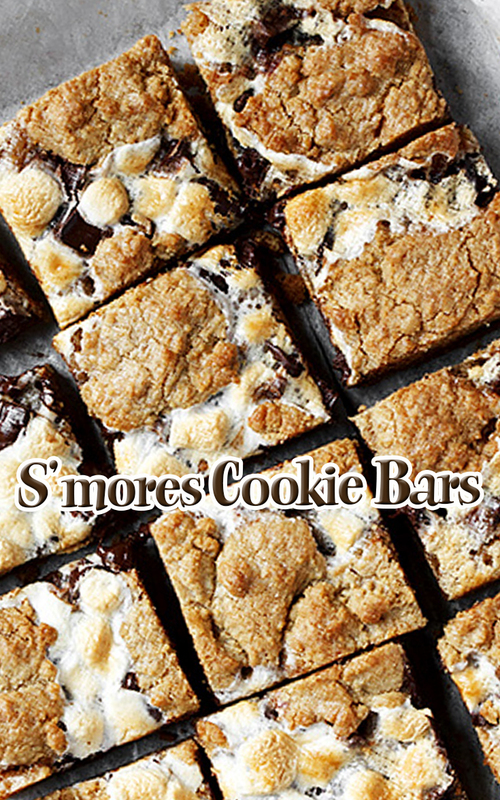 Top with chocolate chunks, then marshmallows. Scatter the reserved dough over-top in clumps. It won't/shouldn't cover the entire top, as you want the chocolate and marshmallows to show through the top. Bake in preheated oven until golden brown, about 30-35 minutes. Set pan on a wire rack to cool completely, then lift out of pan by grabbing the parchment paper. Remove to a cutting board. Trim the outside edges, if desired, then cut into squares.